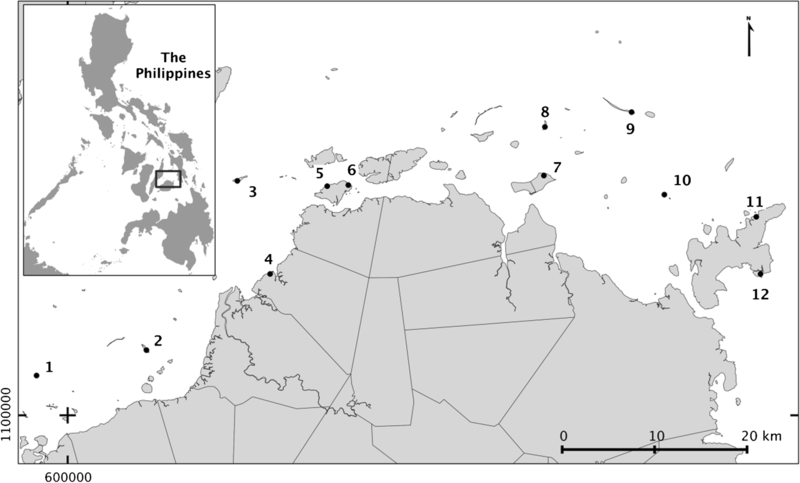 In this paper, we examine the role of gender in community-based management of marine protected areas (MPAs) in the Central Philippines. MPAs are a common conservation and fisheries management tool in this area, but the relationship between gendered fishing practices and participatory MPA management is rarely considered. In this region, women and men’s fishing practices are often socially and ecologically distinct. MPAs are found in both intertidal and subtidal areas where women and men tend to fish respectively. Based on over 500 interviews in 12 fishing communities, MPAs were largely perceived to be a management tool for men’s fishing. Very few men and women reported a negative effect on their personal fishing or displacement from their fishing area. However, in two communities MPAs that had been in intertidal areas had either been moved or opened specifically to allow for gleaning. Women were less likely than men to report that the MPA had a positive effect on their fishing, but women and men recommended the MPA in equal numbers. Women and men reported attending MPA meetings, but women were less likely to describe active participation in MPA management such as decision making. This research adds to the larger body of work that considers gender and inequality to critically examine issues of power and exclusion in community-based resource management. MPAs have become a central tool in conservation and fisheries management globally (Jameson et al. 2002; Hilborn 2004; Wood et al. 2008), with few examinations of gender specific effects (Walker and Robinson 2009; Clabots 2013). The gender dimension of MPAs touches on three overlapping concerns. First, the direct effects of MPAs (both positive and negative) on women and men’s often-distinct target species, fishing practices, and allocation of catch (Hockey and Bosman 1986; Benzoni et al. 2006; Rajagopalan 2008; Walker and Robinson 2009); second, indirect effects of MPAs (both positive and negative) on women and men’s activities such as community participation, or alternative livelihoods. Hence, overall perception of MPAs by community members is also important to consider. Thirdly, the potentially distinct contributions of women and men to MPA management and decision-making (Aswani and Weiant 2004; Pajaro et al. 2010; Di Ciommo and Schiavetti 2012; Clabots 2013). Gender is an important consideration when examining the direct effects of MPAs on fisheries, because women and men often fish differently. For example women and men tend to fish for different animals: women’s fisheries often focus on near shore macro invertebrates (shell, echinoderms, etc. ), while men’s catch is more often dominated by finfish species although these patterns can vary greatly geographically, as well as over time (Siar 2003; Kleiber et al. 2015). The effect of MPAs on particular species can depend on their life-history, including size, mobility, and dispersal of young, as well as interactions among species. MPAs can improve spill-over and larval dispersal of fish and mobile invertebrates that men typically fish for (Halpern and Warner 2002). MPAs have also been shown to be effective at increasing the size and number of macro invertebrates within the area of protection (Hockey and Bosman 1986), although increases in predator species within MPAs can also lead to decreases of certain invertebrate species (Ashworth et al. 2004). Furthermore, the spill-over effect on sessile species may be limited to increasing larvae dispersal (Aswani and Weiant 2004). Where an MPA is placed can also have a different displacement effect on women and men because they often fish in different areas. Women mostly fish in intertidal habitats, while men fish in both intertidal and subtidal habitats depending on the tide and gear (Selgrath et al. 2014; Kleiber et al. 2015). Because the value of MPAs to gleaning fisheries is not always clear, different perceptions of the MPAs from those who rely heavily on invertebrate harvest (primarily women) as compared to those who fish other species and using other methods (primarily men) may serve as an indicator of the varied effects of the MPA as a management tool for different fisheries. Indirect benefits from MPAs can also be gender specific. For example, even in areas where women do not recieve a direct benefit to their own fishing, an improvement in men’s fishing could increasing overall food availability to the household, although this is not always the case (Darling 2014). Other possible benefits may include alternative livelihoods, such as providing food for MPA tourists (Clabots 2013). Hence, even if the MPA benefits for particular gender specific fisheries are not clear, women and men may still support the MPA, but for potentially different reasons. Gender is also an important social variable to consider in the governance of MPAs. In the past 25 years, community-based management (CBM) of small-scale fisheries has been adopted in a variety of contexts, with varying success (Sultana and Abeyasekera 2008; McConney and Charles 2010). While the importance of gender in CBM has been well documented in forestry (Agarwal 2010), there is a growing interest in examining the role of gender in small-scale fisheries governance (Kleiber et al. 2017). Within communities, gender and other demographic factors often explain differences in resource use and fisheries management priorities (Eder 2005; Resurreccion and Elmhirst 2008). Additionally participation in community-based marine management may also be affected by the cultural context that shape how women and men act and interact in public settings such as management meetings (Agarwal 2010; Revollo-Fernández et al. 2015). Hence, it is important to examine if and how women and men participate in MPA governance, and what social and institutional structures influence who participates and how. Our goal is to examine the relationship between gender, fisheries, and participation in the community-based management of no-take MPAs. MPAs are diverse in their size, ecological representation, and governing structures. In this case, we will be specifically examining the relationship between small-scale fisheries and no-take MPAs under community-based management. This relationship is particularly relevant in the Philippines. Starting in the early 1990s, the marine management of municipal waters (15 km offshore) has been decentralized to municipal and village levels (Lowry et al. 2005). Community level marine management often takes the form of no-take MPAs, which in the past have been identified as preferred management measure in this region (Martin-Smith et al. 2004). However, as of 2010 MPAs covered only 0.5% of Philippine municipal waters, and 90% of those MPAs were less than 1 km2 (Weeks et al. 2010). The community-based management of MPAs can also differ greatly and is prone to shift over time often in response to local political factors (Pomeroy et al. 2010). Our research makes an important contribution to the literature that links social and ecological factors in community-based management. In particular, we focus on how women and men differ in assessing MPA effectiveness and outcomes and examine direct and indirect effect of MPAs. We also examine the implications of gender in MPA governance, and discuss what impacts that may have on the effectiveness of MPAs as community-based management tools. Our study included 12 communities with no-take MPAs that were being actively managed by the community (Fig. 1). Seven communities had an MPA that included intertidal habitat that was contiguous with the community shoreline, while in five communities had an MPA in subtidal habitat. Three communities had two MPAs, but were categorized as intertidal if one or more of their MPAs included intertidal habitat. During the process of data collection, in one community, we were told by community leaders that the MPA boundaries had been changed to exclude the intertidal habitat, and in a different community the intertidal area was no longer no-take to gleaning. In both cases, we recategorized these MPAs as subtidal since gleaning was not excluded from these areas (Table 1). All MPAs were actively managed by the community. Although both women and men used a variety of fishing methods, women were primarily gleaners in intertidal habitats, while men typically fished in subtidal habitats by diving or using nets, hooks, or traps (Kleiber et al. 2014). We collaborated with a Philippine-based non-governmental organization, Project Seahorse Foundation for Marine Conservation (PSF) that has worked in Danajon Bank communities in various guises and capacities since 1993. PSF supported our research by providing connections to the local communities, rich advice on approaches and issues, and access to facilities and equipment. In turn, the preliminary results of our study were presented back to PSF to inform ongoing management practices and conservation activities. In addition, each community was invited to a presentation of the preliminary findings, and community leaders were given a poster summarizing the results (all materials were presented in the local language of Cebuano). We randomly selected 588 adult interview respondents (here defined as 16 or older) from the barangay census of each of the 12 communities. The respondent selection was stratified by gender. We only interviewed respondents who had fished (including gleaning) at least once in the last year. Where a selected candidate could not be found, we instead interviewed a family member or neighbor, with the result that sampling was haphazard. Interviews were done after the study had been explained and verbal consent had been sought. Filipino research assistants conducted the interview in the local language (Cebuano), and later translated their notes into English. With the consent of respondents, we made audio recordings and consulted these to clarify responses, but the interview notes served as the primary form of data. We also conducted participant observation of fishing, and had informal discussions about the placement of MPAs in gleaning areas with NGO workers and local community leaders. Does the MPA affect your gleaning and/or fishing catch? Would you recommend MPAs to other communities like yours? Do you participate in MPA management meetings? These questions were developed and translated as a collaborative process between the senior author and the four local research assistants during a week-long practice and training session prior to data collection. To examine perceived changes in catch per unit effort (CPUE), each respondent was asked to estimate their current weekly catch and hours spend fishing for each fishing method they used. This was used to calculate a CPUE where the effort was hours fishing. Respondents were then asked to estimate their catch and hours fishing when they first started fishing with that method. We then compared the difference between the current and original CPUE and categorized them as a negative change (a decrease in CPUE overtime), no change (the same CPUE over time), or a positive change (an increase in CPUE over time). Cases were removed from the analysis if the respondent explained a change in effort (other than time) such as a change in net length. Fishing was categorized as gleaning, or non-gleaning fishing (Table 3). All three questions were coded for a positive or negative response, followed by an open-ended question of “why or why not?” For questions 1 and 2, the open-ended responses were used to explore the community perception of the purpose, function, and utility of the MPA. For question 3, the open-ended responses were used to distinguish between active and passive participation in MPA meetings and management, as well as examine individual reasons for engagement with MPA management. We defined active participation as including the following activities: voicing an opinion in MPA meetings, organizing MPA meetings, educating others about MPA management, or participating directly in MPA management including enforcement activities. For the open-ended portions of each question, we iteratively coded the responses and identified themes (Braun and Clarke 2008). A single respondent may have included more than one theme. After themes had been identified and categorized we found 13, 15, and 15 themes from responses to questions 1, 2, and 3 respectively (Figs. 2, 3, and 4). Variations among the four research assistants and the willingness of respondents to answer certain questions led to unequal sample sizes among answers. Three logistic mixed-effects models were used to examine the binary responses to questions 1–3. The open-ended portion of question 3 was coded for a binary response for active participation (see Table 2 for details), which was included as a fourth model. Gender (female or male) and MPA placement (intertidal or subtidal), were explanatory variables in all four models (Table 2). We used mix-effects models with community as a random factor to account for the hierarchical structure of the data, and inter-community variation (Gelman and Hill 2009; Zuur et al. 2009), using the “lme4” R packages (Bates 2010; R Development Core Team 2013). The Danajon Bank consists of many small communities on two series of atolls, as well as larger terrestrial islands off the Bohol mainland (Fig. 1). Poverty is prevalent throughout this region (Guieb 2008), and food insecurity is also common (Fabinyi 2012). Overfishing and destructive fishing have put tremendous pressure on local marine ecosystems (Christie et al. 2006). In the Danajon Bank, Central Philippines, fisheries management regulation has included gear and boat restrictions (Selgrath et al. 2018), as well as spatial management such as MPAs. In the Philippines MPAs are part of a national strategy to conserve coastal and fisheries resources (Weeks et al. 2010), and in many cases are implemented and managed at a community scale (Alcala 1998). Some municipalities actively enforce laws in their municipal waters while others lack appropriate staffing. MPA monitoring and management in this area is influenced by passing political powers, and episodic NGO involvement (Russ and Alcala 1999). In this study, all of the 15 MPAs in the 12 communities were officially no-take MPAs, which effectively banned all forms of fishing within the core of the MPA. There was one exception: Pandanon Fish Refuge and Sanctuary allowed squid jigging (Table 1). The MPAs were designated between 1986 and 2005, with over 65% being designated after 2005. The management structures for the MPAs varied slightly, but generally included elected barangay councilors, and members of a People’s Organization or Fishers’ Organization (Table 1). In only one community (Batasan) was a Women’s Organization part of the management structure, although they were later subsumed into the larger Fishers’ Organization. An understanding of gender equality in the Philippines provides important context to the discussion of gender and management examined in this paper. In the 2014 Global Gender Gap Report, the Philippines ranked 9 out 142 countries on the global gender equality scale (Schwab et al. 2014), ranking above Canada (19th) and the United States (20th). A perception of equality is mirrored by the local community where in general women and men in the Northern and Central Philippines (which include the area of this study) agree on the fact that women have greater autonomy and say in household decision-making (Ghuman et al. 2006). However, it should also be noted that gender roles for women and men in the Philippines are at times very pronounced and circumscribed and can be observed in fisheries, households, and community labor. Both women and men fish, although women’s primary method is gleaning, while men’s primary method of fishing is from boats. These roles are flexible and may be influenced by opportunity and availability. For example, in addition to gleaning, 20% of women fish from boats, but always accompanied by a male relative (very often their husband). Fifty percent of men also glean, but often as the secondary form of fishing (Kleiber et al. 2014). Within coastal communities household labor is often distinctly gendered and has been observed to begin with children as young as seven (Yater 1982). By adulthood, women are responsible for most domestic tasks including cooking, cleaning, and childcare, but also the management of the household income (Yater 1982). Gender roles have also been found to shift in response to changes in resource availability and resource strategies. In cases where men’s fisheries have dwindled and are not able to support a household, women have increased their economic roles (Israel-Sobritchea 1994). In other cases, men have also shifted their roles to occupy spheres that were once the domain of women (Turgo 2014). Beyond the households, gender roles also influence the type of community work and local institutions women and men participate in. At the community or barangay level, there are elected Barangay Councilors led by a Barangay Captain. In the communities of the Danajon Bank there were women elected to these positions, but less frequently than men. Each community also typically had tanods (local police), fish wardens, and barangay health workers. In the communities we visited for this study, tanods and fish wardens were almost always men, while most barangay health workers were woman. Communities can also have People’s Organizations which can represent a subset of the population including fishermen (or in some cases fisherfolk), women, or youth (Clabots 2013). These groups can all play a role in the management of the MPAs. In this section we report the proportion of the binary questions and frequency of open responses to the three open follow-up questions. We also report the statistical analysis results of comparing women and men’s binary responses using logistic mixed effect models. We also include observations from the field and conversations with local leaders and NGO workers. Overall, 46% of respondents felt that the local MPA had an effect on their personal fishing, but this differed significantly by gender. 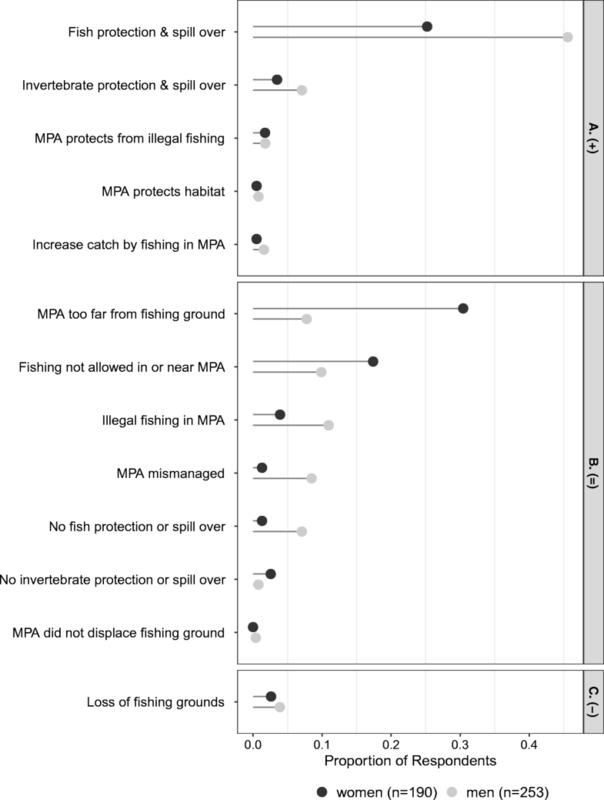 Thirty-three percent of women and 57% of men reported that the MPA affected their fishing (Table 2). Respondents’ perception of MPAs did not differ by whether their MPA was intertidal or subtidal. Among the respondents who reported that the MPA had an effect on their fishing, only a small number stated that the MPA had a negative effect on their fishing (3% of women and 4% of men). In these cases both women and men stated the MPA decreased their fish catch by limiting their fishing grounds (Fig. 2). Among the women and men that perceived a positive effect from the MPA on their fishing, most cited spill-over as the reason (Fig. 2). However, women and men that did not perceive any effect of the MPA on their fishing gave different answers. Women’s most frequent reason for the lack of effect was that the MPA was too far from their fishing ground, followed by the explanation that fishing was not allowed in the MPA. Men also cited these reasons (although at lower rates), but also discussed illegal fishing, MPA mismanagement, and lack of spill-over (Fig. 2). Seventy-one percent of respondents said they would recommend an MPA to other communities, and this did not differ by gender or MPA placement (Table 2). Both women and men most frequently declared fish protection and spill-over as justification for recommending MPAs (Fig. 3). Both women and men also mentioned unspecified current and future benefits to the community. Among those that would not recommend the MPA, the most common coded elaboration was that they were too busy to tell other people about the MPA, or otherwise unwilling to do so (Fig. 3). However, women more frequently stated that other communities already had MPAs, so there would be no need to recommend them (Fig. 3). It was noticeable that very few respondents, regardless of gender, described a disliked MPAs or felt they were badly managed (Fig. 3). Approximately half of the respondents, regardless of gender or MPA placement, reported participating in MPA management meetings. However, only 8% of respondents reported participating actively in MPA management. Men were significantly more likely to participate actively than women, and active participation was higher in communities with subtidal MPAs (Table 2). Overall women and men gave different reasons for why they did or did not participate in MPA meetings although the most frequent reason for attending meetings of both women and men was to learn about the rules and current status of the MPA. The second most common reason for women was out of obligation as a member of the MPA organization, People’s Organization, or community. In contrast, for men the second most commonly expressed reason for attending a meeting was as part of their active participation in the management of the MPA (Fig. 4). Among those that did not attend meetings, both women and men cited lack of membership in the community level organization that managed the MPA as the top reason they did not attend. However, the second most common reason women gave for non-attendance was that they were not a man or a fisherman.1 While both men and women cited age and recent immigration to the community as reasons for not attending, no male respondents used gender to explain their lack of attendance. Lower frequency responses also illustrated important differences between women and men. For example, 3% of women that attended reported being there as a substitute for their husband but only one man reported substituting for a female family member. Among those that did not attend MPA meetings, the opposite was true: 5% of men stated that they sent a substitute, while no women claimed to send a substitute (Fig. 4). Although respondents were mostly supportive of MPAs, we observed and were also told about ambiguous application of MPA rules, including changes to MPA boundaries to exclude gleaning areas from the MPA. In one study community, the landward MPA boundary was moved from the shore to beyond the intertidal areas, solely to allow for gleaning. This was seen as particularly important as the two neighboring MPAs also encompassed gleaning areas. The community leader explained that both neighboring communities had an MPA in their gleaning area, so they changed their MPA so that people could have a place to get food. The theme of food security was also found to justify opening MPAs to gleaning in a different community. Some community members described the MPA as being open to gleaning in times of hardship, which would reframe the MPA from a no-take zone to a temporal closure with a stated objective of mitigating vulnerability to food and economic insecurity. However, other members stated that the MPA was closed to all fishing including gleaning, indicating disagreement or ambiguity regarding the rules. While we were in this community, we witnessed gleaning within the clearly marked MPA boundaries. Depending on the interpretation of the rules, the gleaning could be a sanctioned exception to the no-take rule, or simply a lack of compliance. In a third case, we were told by an NGO professional of women in one community (not part of our study) organizing to stop the placement of an MPA in the community’s gleaning area. By participating in an MPA planning meeting as a group, women were effectively able to negotiate for the placement of the MPA outside their fishing areas (L. Rosario, personal communication). Most respondents reported a decline in their CPUE (Table 3). Fifty-nine percent of respondents reported a decline in the gleaning CPUE, while 71% of respondents reported a decline in their non-gleaning fisheries. Gender was an important variable in the perceived effect of the MPA on fishing, and the motivation and type of participation in community-based management of MPAs. The results from our study suggest that MPAs in this area were created and are primarily managed with men’s fisheries in mind. 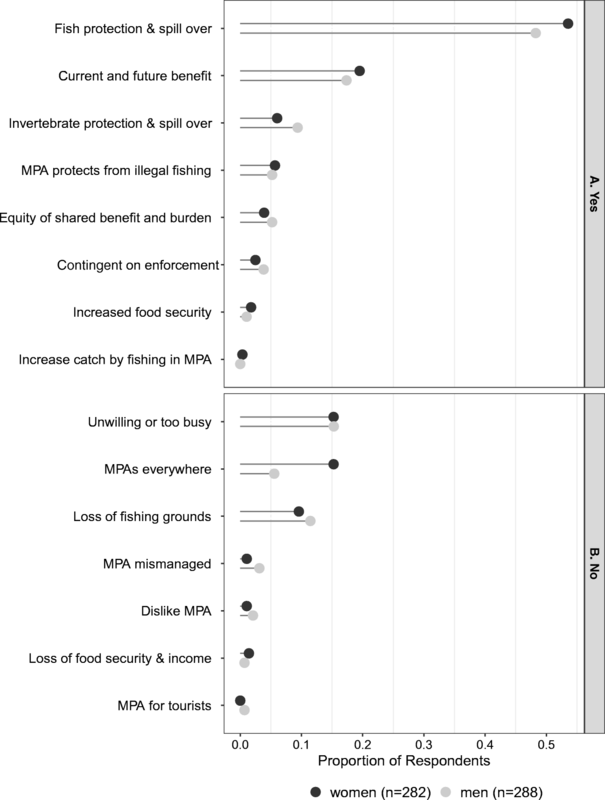 Women were less likely than men to state that the MPA benefitted their own fishing, and were less likely to actively participate in MPA management. 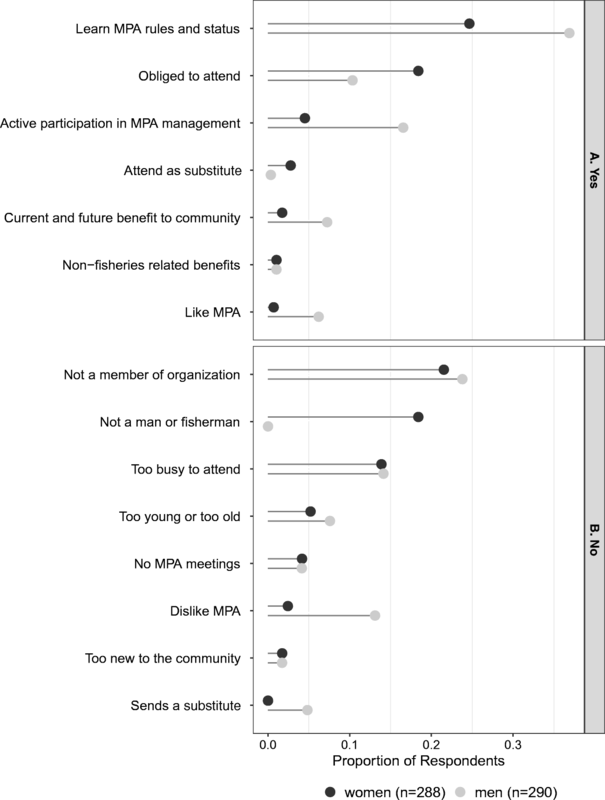 The placement of the MPA did not have an effect on the percieved MPA fishing benefits, or how people felt about the MPAs more generally, although active participation was higher in communities with subtidal MPAs. The utility of no-take areas as a fisheries management tool is often described as a balance between the loss of fishing grounds, and the benefits of increased biomass. However, who loses and who benefits and how is an interaction between where the MPA is placed, and how, where, and why people fish (Eder 2005). Gender roles in fisheries can be an important part of that interaction. The foundational work on gendered effects of protected areas was done in forestry contexts (Agarwal 2010), but has also more recently been studied in coastal contexts (Rajagopalan 2008; Walker and Robinson 2009; Baker-Médard 2017). A common focus of these studies is describing or interrogating the distinct displacement of women and men from key resource areas. For example in the Gulf of Mannar, India, all women seaweed fishers, and small canoe fishermen were displaced from their fishing grounds by a National Park that created a no-take marine zone (Rajagopalan 2008). In another example, women gleaners in Madagascar no longer fished, or fished illegally at night, because a no-take marine protected area had been placed on their fishing grounds (Baker-Médard 2017). However, displacement is not always distinctly gendered. In a study from French Polynesia, both women and men were similarly affected by MPAs, and the more important limiting factor was access to boats which in this context was not gender specific (Walker and Robinson 2009). The concern about displacement of women and gleaning fisheries by community managed MPAs is due to the common placement of MPAs close the community, often to allow for easier community policing. This can overlap with fishing areas that women tend to access, because their social roles can limit how far they can go to fish. For example, in Kiribati “Gleaning shellfish is women’s major fishing activity because it can be done close to home, takes relatively little time, requires no costly fishing equipment and may be done in the company of children” (Tekanene 2006). It is important to note that this can also impact men who do not have access to boats, or do not have access to boats with motors (Eder 2005; Walker and Robinson 2009). In our study, only a few people mentioned being displaced from their fishing grounds (3% of women, 4% of men). This might suggest that MPAs in these communities, even in intertidal areas, do not displace gleaning fisheries in these areas. This appeared to be true in one community where the intertidal MPA was along the shore, but some women explained that it was far from where they lived, and they did not fish there. In contrast, in discussions with MPA managers, it was clear that in at least two cases, MPAs previously in gleaning areas had either been moved out of gleaning areas, or periodically opened up to gleaning. By changing where the MPA was placed, or relaxing the no-take rule, displacement was no longer an issue. Discussions about changing the MPA area or no-take rules to accommodate gleaning often included an emphasis on gleaning as a source of food security, as well as a characterization of gleaners as relatively impoverished, or underserved. Hence, the permeability of MPAs to gleaning in certain communities reflect the social value given to of the use of the catch (subsistence) and the perceived identity of the fishers (poor and often female), which has been found in other cases in the Philippines (Eder 2005). In this study, we did not find that the MPA displaced women or gleaners, either because the MPA was not placed in their fishing area, or it was later open to gleaning. However, the benefits of MPAs to gleaning fisheries were also not clear. Gleaning is often not included in fisheries assessments, although it is likely that in some contexts, gleaning may be unsustainable if not properly managed (Fröcklin et al. 2014). Using a crude measure of effort, we found that like other forms of fishing most gleaners reported a decline in CPUE over time (Table 3). This suggests the needs to consider gleaning in fisheries management, and the question is if MPAs are an effective management tool for species that gleaners target. No-take MPAs can increase the number of macro-invertebrate biomass within the protected area (Hockey and Bosman 1986), but many fisheries management regimes for sessile invertebrates include periodic, or spatially rotating closures (Thorburn 2000). In fact, the changes to the MPA rules in one community more closely matched that of periodic closures, suggesting a need to recategorize the management regime (Cohen and Foale 2013). While women were less likely than men to state a positive effect from the MPA on their fishing, similar numbers of women and men would recommend MPAs. This suggests that MPAs provide benefits to women beyond personal fishing improvement. In a different example from the Central Philippines, MPAs provided livelihood benefits to the organizing women’s group through dive tourism (Clabots 2013). Alternative livelihoods were not often mentioned in by respondents in our study, instead explanations of a general increase in fish through spill-over suggested benefits to fishing at the community level (Yasué et al. 2010). Management meetings were often characterized as being a predominantly male space. On the surface, this is somewhat surprising since equal numbers of women and men stated that they participated in MPA meetings. By contrast in a study in the same region of the Central Philippines women were sometimes observed making up 70–80% of attendees at fisheries outreach meetings (Clabots 2013). Equal attendance was not found to be true in contexts in Brazil (Di Ciommo and Schiavetti 2012) and the Caribbean (Smith 2012), where women made up a smaller portion of all people attending community marine management planning meetings. However, even in cases where women made up half, or even the majority of attendees, it is not certain that this would translate into active participation in decision-making and management, which could include speaking in a meeting, or participating in education or enforcement. In Brazil, women felt uncomfortable voicing their opinions in the male-dominated space (Di Ciommo and Schiavetti 2012). In the Caribbean, women’s perceived lack of participation in fisheries was thought to explain their lower participation in management (Smith 2012). We heard similar sentiments in our study when one female respondent explained that it would be better for men to participate in meetings because it was about their fishing. Through the interviews, many also expressed that they attended to represent their husbands, or as one woman explained that she listened for her husband. This suggests prioritization of management focused on men’s fisheries. Hence, in this framework where women’s fisheries and management needs are secondary, their participation is also subsidiary. Lack of membership in the MPA organization was a frequently cited factor for not participating. In some communities, the MPA organization overlaps with the Fishers’ or People’s Organization (PO). Fishers’ collectives often only include fishers that use particular types of gear, excluding gleaners and those who engage in other types of fishing. This type of institutional exclusion has also been found in other context such as Japan where women have been denied membership in the governing Fishing Cooperatives (Kleiber et al. 2017). However, some People’s Organizations are specific to women and have been found to be key participants in MPA management. In our study, one community had an initial community MPA management structure that included a women’s PO, but it was later subsumed into the community fisher’s association. In a study previously done in one of our study communities, the women’s group was consulted about MPA objectives and indicators of success (Pajaro et al. 2010). In this example, women’s fishing was not necessarily a key consideration, although women’s groups did not differ very much from other groups in their stated objectives and indicators for the MPA. In another study from the central Philippines, the management of MPAs in two communities known to have high levels of women’s involvement found that the participation of women’s groups was a key factor in the creation and maintenance of the community MPA (Clabots 2013). In another example from the Solomon islands, an all-women’s group was formed to plan, manage, and collect data on an MPA that was designed specifically for their fisheries—predominantly shell collection while gleaning (Aswani and Weiant 2004). Other institutions involved in the management of MPAs include elected officials of the community, headed by the Barangay captain. In our study area, women held positions as elected officials, but often in smaller numbers than men. The other community positions include the tanods (community police), fish wardens, and the barangay health workers. The tanods and fish wardens are almost always men, and they often participate in the enforcement of MPAs. In a previous study, it was also found that volunteers to monitor the MPA were mostly men, while data recording work was more often done by women (Pajaro et al. 2010). Other aspects of community work are dominated by women such as health workers. Hence, the gender division of civic labor may limit both women and men’s participation in various aspects of the community. Efforts to address these particular exclusions include integrated conservation and reproductive health approaches (D’Agnes et al. 2005). By focusing on gender, we have highlighted links between social and ecological factors associated with effective resource management at a community and ecosystem scale. In this and other contexts, it is important to acknowledge stakeholders should include all community members that rely on marine resources for their subsistence and livelihood. In this study we have focused on fishing activities, but this would also ideally include people primarily involved in the processing and marketing of marine resources (Overå 1993; Andrew et al. 2007; Tindall and Holvoet 2008). Livelihood approaches may highlight important and potentially underrepresented groups. For example, a livelihood and gender approach to Tanzania fisheries management found that female fisher traders were excluded from formal fisheries management structures (Fröcklin et al. 2013). Community-based management may fail when diverse and potentially conflicting management priorities are not represented in decision-making groups (Agrawal and Gibson 1999). In the context of this study, the intentional inclusion of gleaning and gleaners would be important for MPA management, as well as fisheries and coastal management more broadly. Definitions of fishing that do not include gleaning mask the participation of most women and many men and exclude them as stakeholders, even though they may be directly affected depending on where the MPA is placed. Management would benefit from considering the flexibility of MPA rules to local needs, and particularly to issues of food security. This is of particular concern to women, given their socially proscribed roles in the domestic sphere. We found two cases where the MPA had either shifted from no-take zones to periodic closures, or had reverted to open access. Spatial marine management in this area had traditionally included flexibility of access to subsistence fishers (Guieb 2008). Based on our findings it is clear that a focus on gender and consideration of gender roles and role expectations should begin in the early planning stages of MPA development to include a wider diversity of stakeholder needs. We interviewed people that had fished (including gleaning) in the past year, but local definitions of fishing, and occupational definitions of fishermen often exclude gleaning and women. D.K. received funding for this project from the World Wildlife Fund, The University of British Columbia Liu Institute, and the International Federation of University Women. This project also benefited from support by Guylian Chocolates Belgium and an anonymous donor through their partnerships for marine conservation with Project Seahorse. Fröcklin, S., M. De La Torre-Castro, E. Håkansson, A. Carlsson, M. Magnusson, and N.S. Jiddawi. 2014. Towards improved management of tropical invertebrate fisheries: Including time series and gender, ed Sebastian C. A. Ferse. PLoS One: 42:e91161. https://doi.org/10.1371/journal.pone.0091161.